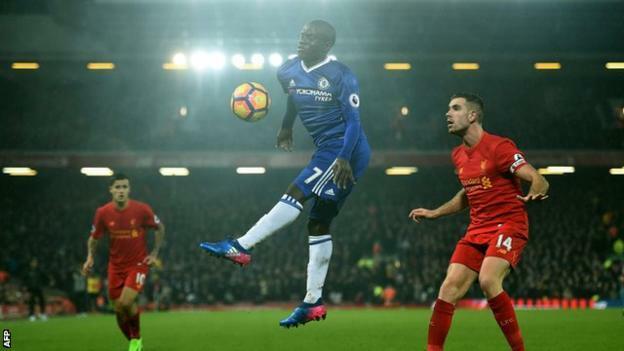 Chelsea had to settle for a draw against a much-improved Liverpool at Anfield after Diego Costa's late penalty was saved by Simon Mignolet - but still extended their lead at top of the Premier League to nine points. 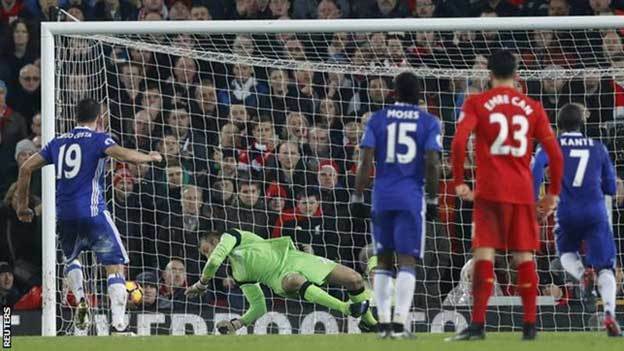 Liverpool keeper Mignolet made amends for his first-half embarrassment when he had been caught off guard by David Luiz's superb free-kick from 25 yards. Georginio Wijnaldum's close-range header 11 minutes after the break gave Liverpool a draw they fully deserved, ending a run of three successive home losses, two of which knocked them out of the EFL Cup and the FA Cup. 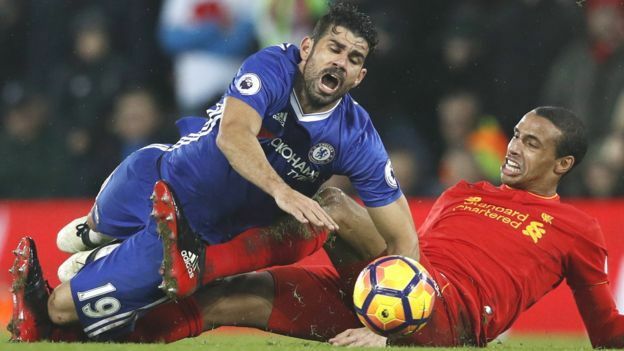 However, it could have been much better for Chelsea and worse for Liverpool when Costa went to ground under challenge from Joel Matip 14 minutes from the end. Referee Mark Clattenburg pointed to the spot but Mignolet dived low to his right to save the Spain striker's spot-kick. Roberto Firmino wasted Liverpool's two best chances, shooting high over an open goal and heading straight at Thibaut Courtois in the closing seconds. Chelsea manager Antonio Conte disguised his disappointment about Costa's late penalty being saved by Mignolet with his reaction at the final whistle. The Italian knew Chelsea would be facing a wounded Liverpool after those three damaging defeats - and he clearly saw this as one point won rather than two lost as he went straight to the visiting fans and pumped his fists in delight. The Blues were not at their best and yet showed the resilience and compactness of old as they were dominated in possession but kept Liverpool at arm's length for most of the game. And in N'Golo Kante they had the game's outstanding performer, perpetual motion and first to every loose ball in midfield and at both ends of the pitch. Costa had an off night, including squandering the penalty, but Chelsea found answers elsewhere and carried a threat of their own after Pedro came on as a late substitute. Chelsea may only return to London with a point, but results elsewhere for Arsenal and Tottenham made this a good night for the Premier League leaders. Liverpool manager Jurgen Klopp had endured his worst week since arriving at Anfield in October 2015 with the Premier League defeat by Swansea City, the EFL Cup semi-final loss to Southampton and the FA Cup fourth-round humiliation against Championship side Wolves. The German, however, has proved his mettle against his closest Premier League rivals - and once again he emerged unbeaten to maintain his excellent record against Arsenal, Chelsea, Manchester City, Manchester United and Tottenham since his appointment. This draw means that he has played 15 league games against that group, winning six, drawing eight and losing only one, a home defeat by United last season. Liverpool's hopes of a first title since 1990 are receding as they are 10 points behind Chelsea - but there was plenty for Klopp to be happy about. 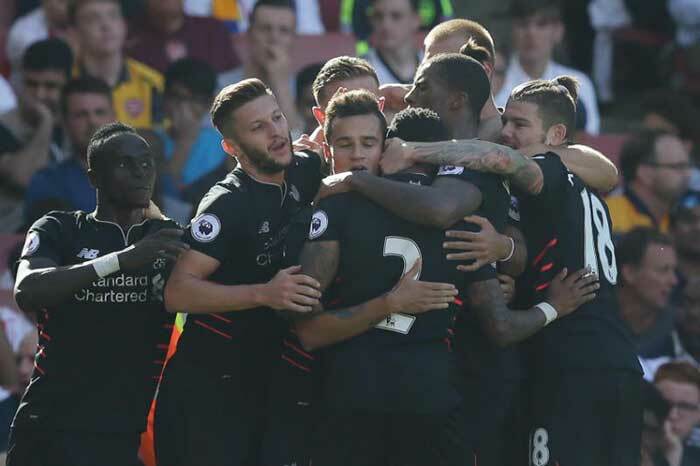 This was more like the high-intensity Liverpool of the early months of the season, although their play lacks subtlety at times as they seem to get carried away by the emotion of the crowd, as well as their animated manager in his technical area. 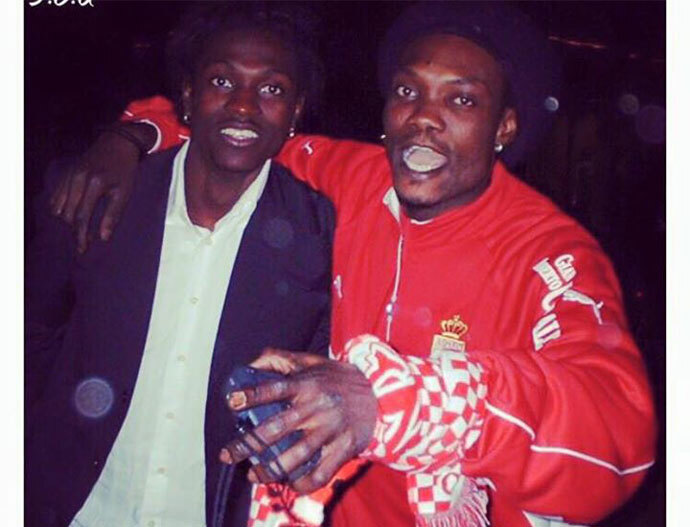 And further good news was the sight of leading scorer Sadio Mane, who has nine league goals, coming on as a substitute after his return from Africa Cup Of Nations duty with Senegal. Liverpool manager Jurgen Klopp: "I said before the game - and people didn't like it - but this wonderful, powerful club needs to keep its nerves. "Not everything is bad because we lose. This team is outstanding in attitude so let's do the best we can and see where we end up at the end of the season. The results tonight were good for us, but we must continue to fight." Chelsea manager Antonio Conte: "It was a very tough game. Both teams tried to play with intensity. I'm pleased. We saw a different game to when we played Liverpool and lost at home. 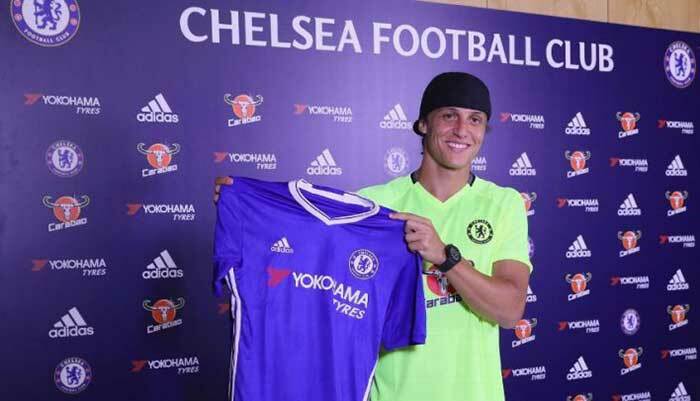 David Luiz scored his first Premier League goal for Chelsea since April 2013 - 1,386 days ago. All 14 of Georginio Wijnaldum's Premier League goals have been scored in home games (11 for Newcastle, three for Liverpool). Simon Mignolet has saved six of the 14 penalties he has faced in the Premier League as a Liverpool player, more than any other keeper for the Reds. Chelsea are unbeaten in their past five Premier League trips to Anfield, last losing there in May 2012. The Reds have gone five games without a home win in all competitions for the first time since October 2012.